The entire metro area is under a Winter Storm Warning. Stay with 5 On Your Side for the latest developments in the forecast. 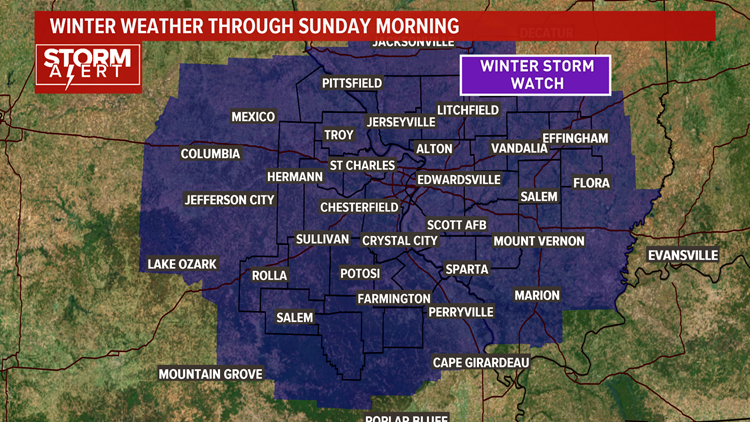 ST. LOUIS - A Winter Storm Warning has been issued for the entire St. Louis metro area for a system that'll bring accumulating snow across the bi-state from Friday evening through Saturday midday. Thursday is the dry day before the upcoming storm. Expect cloudy skies in the morning with partly cloudy weather in the afternoon. Our Thursday is cold with St. Louis area high temperatures in the lower to middle 30s. Winds will be light. On Friday, clouds and moisture will return to the bi-state. We'll start with a dry sky and cold temperatures. 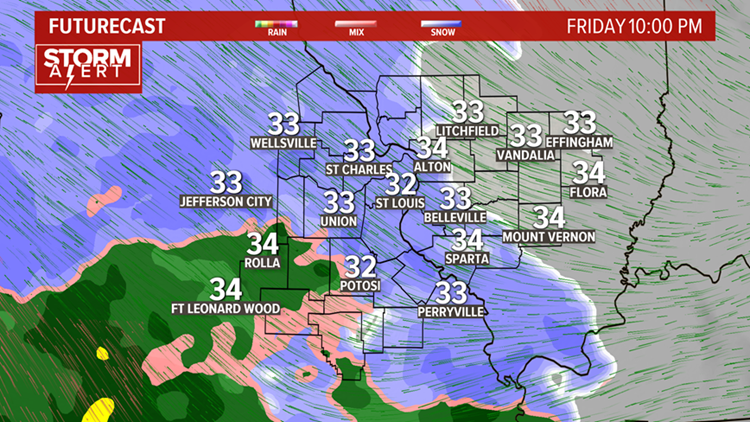 Expect temperatures to rise into the middle 30s, just above freezing Friday afternoon, with precipitation moving toward St. Louis after 1 p.m.
An area of rain and sleet will develop at this time, with a fairly quick change to snow after the wintry mix begins. 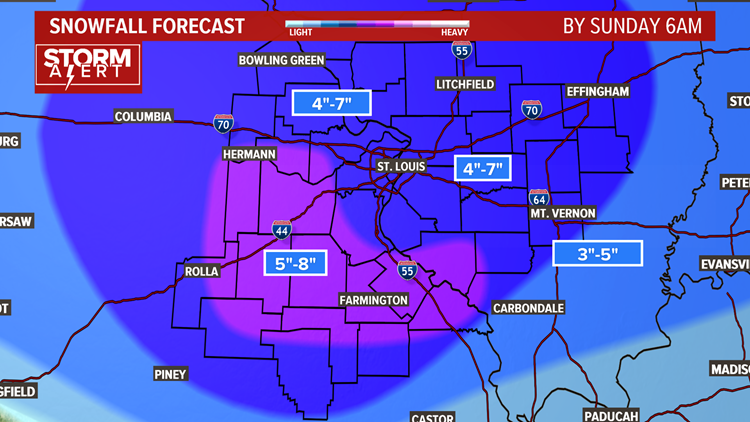 Wintry weather timing for metro St. Louis will likely be between 3 p.m. and 5 p.m. By dinner time Friday, light to moderate snow will be falling in metro St. Louis, with temperatures falling below freezing. Snow will become more intense Friday evening and through the night with several inches of snow accumulating across the St. Louis region. 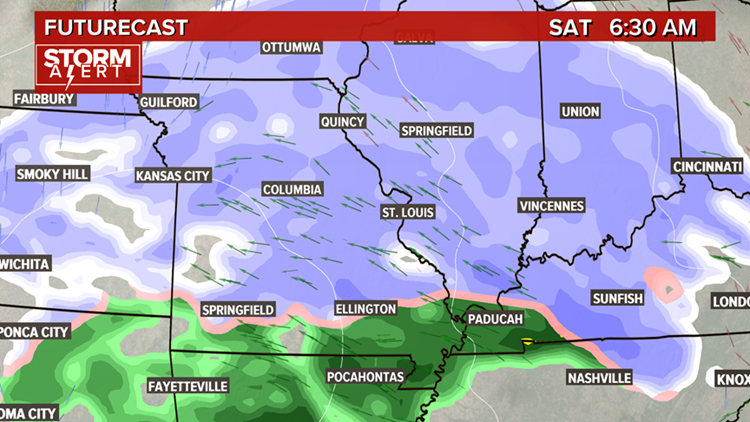 Saturday morning will be snowy for the bi-state, with an intense band of snow moving through the region. Snow will ease by late morning or midday on Saturday. Expect 4 to 8 inches of snow on the ground at this point on Saturday. Temperatures will rise to slightly above freezing Saturday afternoon. Snow showers or light snow will continue through the rest of the day into Saturday night. Additional accumulations will likely be an inch or less, but a few spots may pick up another 2 inches through Sunday morning. Aside from a few snow showers on Sunday morning, the sticking snow will be done. Total Snow From Friday Night to Sunday Morning. Temperatures will stay in the 30s. Dry weather returns next week along with some sunshine. Temperatures will be in the 30s on Monday, with warmer 40s for next week Tuesday through Thursday. It is important to remember that the snow forecast will be adjusted over the next 24 to 36 hours, so stay with 5 On Your Side for updates.